AGBM Online will contain dynamic information to help Grace Brethren pastors be successful in ministry. 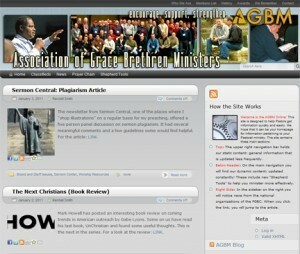 The Association of Grace Brethren Ministers (AGBM) has unveiled their new online presence: AGBM Online. This site is designed to help pastors get information quickly and easily. “We hope that it can be your homepage for information pertaining to your pastoral ministry,” says Randy Smith, pastor of the Grace Brethren Church in Sebring, Fla, and an AGBM board member, who worked with his associate, Aaron Michaud, to see the site go live. The site contains three main sections. The upper right navigation bar holds static content: general information that is updated less frequently. The main navigation menu contains dynamic content: news that is updated constantly! These include the new Shepherd Tools to help pastors minister more effectively. In the sidebar on the right is news from the national organizations of the Fellowship of Grace Brethren Churches (FGBC). The existing AGBM Blog, which is maintained by the Brethren Missionary Herald Company for the AGBM, will continue for the time being to include news and information that is important to those in ministry in the Grace Brethren network.